Hendrik Meurkens has a knack for coining words. It is almost as if he sees the word as part of a lyrical line which he composes on his chromatic harmonica. 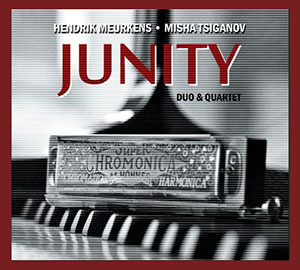 On his album with long-time pianist, Misha Tsiganov, he has coined the title of the album: Junity, a combination of the English word “unity” and the Portuguese one, “junto,” meaning together. This is taken to describe the relationship between Mr. Meurkens and Mr. Tsiganov, something that goes way back to the 90’s and to the first Samba Jazz Quartet founded by the harmonica player. Since then the relationship has matured and become more intimate to the extent that Mr. Meurkens now sees it fit to record something as intimate as in a duo setting several of the most intimate songs in his playbook. So much so that even when the duo is expanded to a quartet, the music feels equally intimate; again, as if a secret were being revealed. Mr. Meurkens is a master of revelation. He has such superior breath control that he is capable of filling notes with such perfect pitch and absolutely precise timbre almost as if he designed the notes themselves. There are those who believe that Mr. Meurkens plays like a horn player. But he is actually one better than that. He plays as if he is singing an aria in an opera. Perhaps it is the German side of him taking over. But he plays with such elemental beauty that his music can only be compared as such. Misha Tsiganov does not linger too far behind. 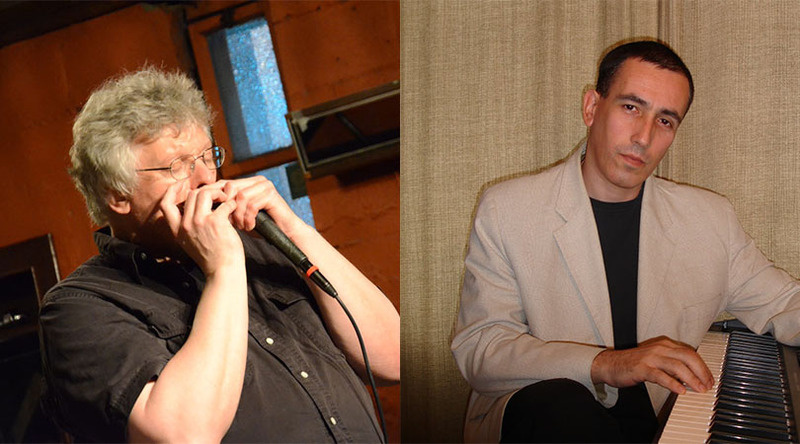 A fine virtuoso pianist to begin with, long years of playing with Hendrik Meurkens has honed his skill to the point where he also plays notes that seem perfectly matched for the harmonica to take up and then throw back at the pianist. Mr. Tsiganov originally comes from Russia, where pianists go through grueling study to hone their skills—something like what happens in Cuba as well. Mr. Tsiganov fills his music with delightful motifs and surrounds these with brilliant melismas so that he weaves florid tapestries with Mr. Meurkens’ own melisma. Yet this all sounds so much like it is invented on the spot, even if it is not. The music that these two men play has a studied grace about it. It is crafted and polished after the melodies are written and rehearsed and planned to perfection. The program begins with a classic “harmonica” tune: “Blackbird.” This is a chart that that other great harmonica player, the ineffable Toots Thielemans made famous on Jaco Pastorious’ Word of Mouth album. For Mr. Meurkens and Mr. Tsiganov even to attempt it would be to be sure that they would reinvent the whole piece right down to the melodic inventions and the rhythmic breakdown. This is exactly what is done to this Lennon-McCartney classic. The same holds true for another Beatles chart, “Norwegian Wood,” which has also been rhythmically reinvented. Mr. Meurkens’ ingenuity for emotion is evidenced by two beautiful duets with Misha Tsiganov. The first is on Antonio Carlos Jobim’s classic, “Luiza,” and the second is on Thelonious Monk’s “Ruby My Dear,” which are both played with such elemental tenderness that the heart literally stops beating for the entire length of the pieces. Of course, no Hendrik Meurkens repertoire would be complete without a choro and here too, Mr. Meurkens plays an intricate piece: “Menina na Janela,” which retraces his steps back to Brasil. Misha Tsiganov shines on a piece he composed to pay homage to his the late classicist, “Scriabin” and the pianist also performs magnificently on Scriabin’s own “Etude Op.2, No. 1.” This is a masterpiece of an album. It would be interesting to see where the musicians would go next. Track List: Blackbird; Luiza; Lady Bear’s Lullaby; Junity; Norwegian Wood; Olena; Pent up House; Ruby My Dear; Menina na Janela; West Coast Blues; Scriabin; Close Enough for Love; Etude Op. 2, No. 1. Personnel: Hendrik Meurkens: harmonica; Misha Tsiganov: piano; Oleg Osenkov: bass (1, 3, 5, 7, 10, 12); Willard Dyson: drums (1, 3, 5, 7, 10, 12).